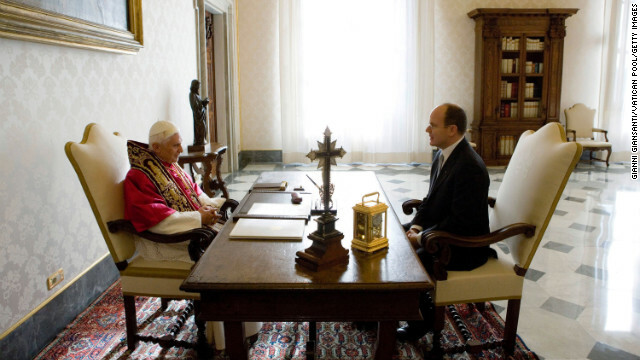 Benedict talks with bishops in Saint Peter’s Square at the Vatican after his weekly general address in November 2009. 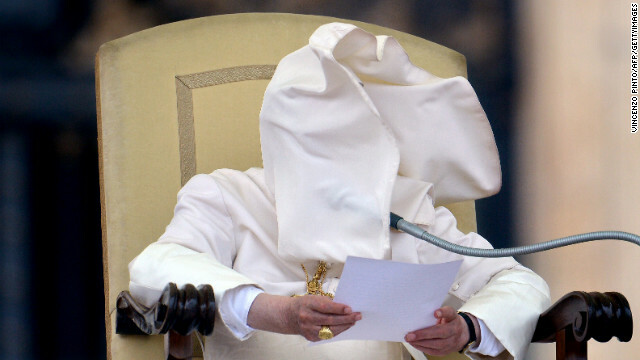 A gust of wind blows Benedict’s collar into his face in September 2012 during his weekly address in Saint Peter’s Square. 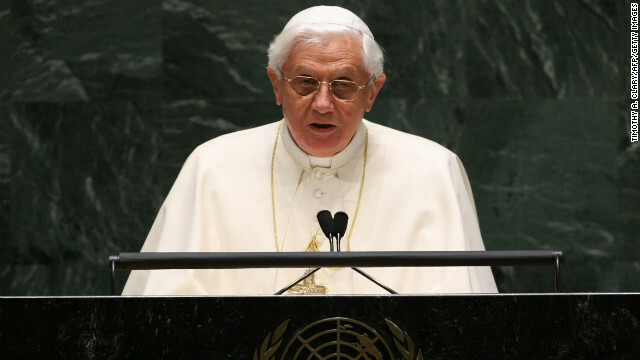 Benedict speaks at the United Nations General Assembly in New York in April 2008. 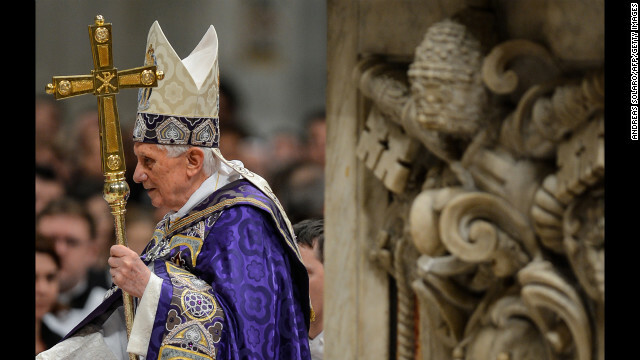 Ratzinger fills in for Pope John Paul II during the Easter Vigil service in Saint Peter’s Basilica in March 2005. 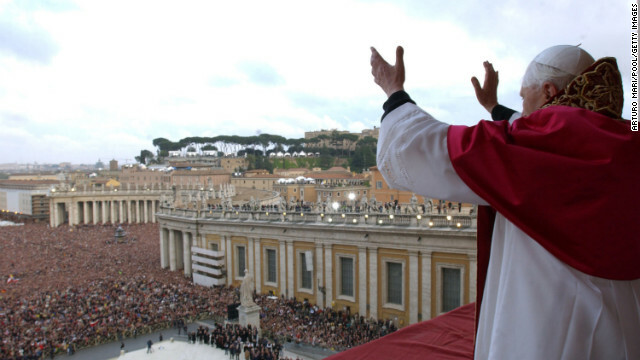 Newly elected as pope, Benedict XVI gestures to the crowd in St. Peter’s Square in Vatican City on April 19, 2005. 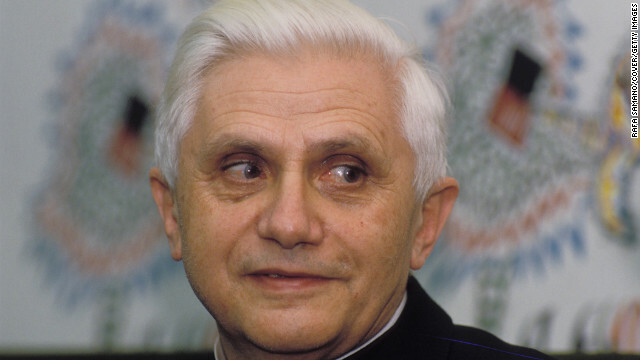 Ratzinger, who was serving as cardinal-priest of Santa Maria Consolatrice al Tiburtino, visits Madrid in 1989. 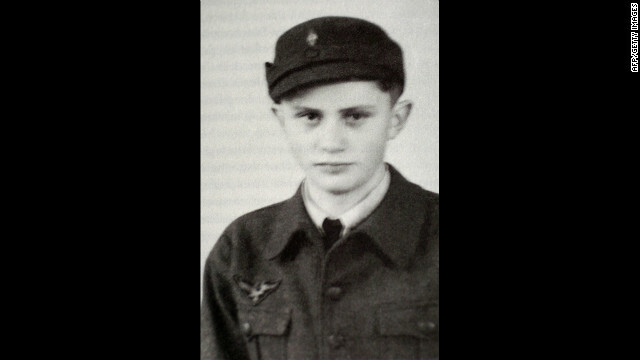 Joseph Ratzinger, who became the 265th pope in 2005, poses for a photo while a German air force assistant in 1943. 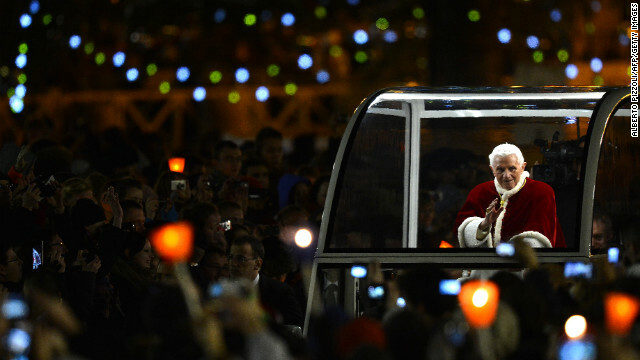 Pope Benedict XVI waves in St. Peter’s Square in the Vatican in December 2012. 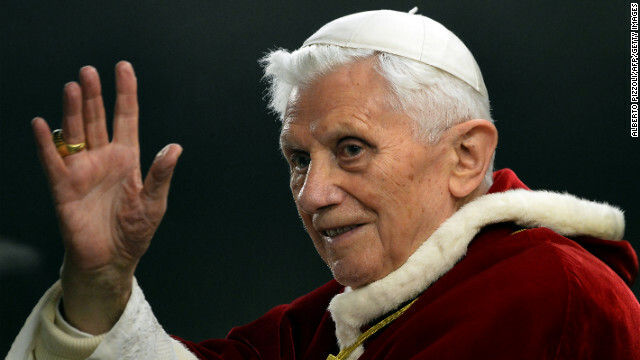 Benedict, 85, announced on Monday, February 11, that he will resign at the end of February “because of advanced age.” The last pope to resign was Gregory XII in 1415. 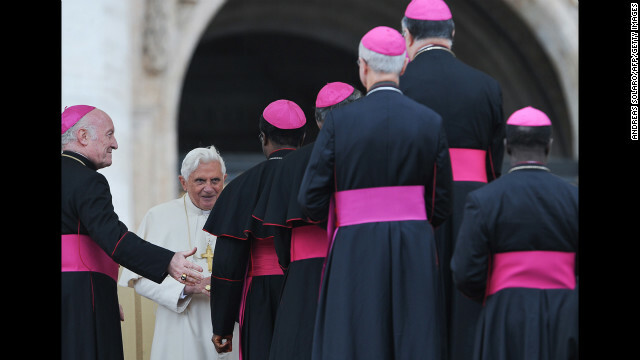 Benedict arrives to lead the Vesper prayer with members of Rome’s universities in December 2012 at St. Peter’s Basilica. 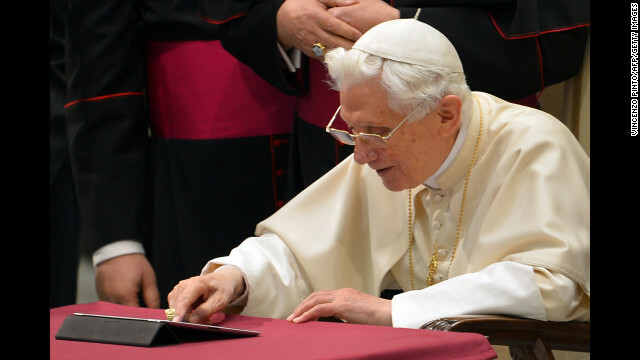 Benedict clicks on a tablet to send his first tweet from his account @pontifex at the Vatican in December 2012. 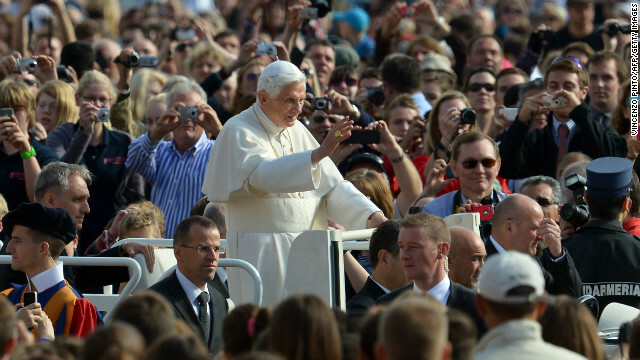 Benedict waves to pilgrims as he arrives at St. Peter’s Square for his weekly address in October 2012. 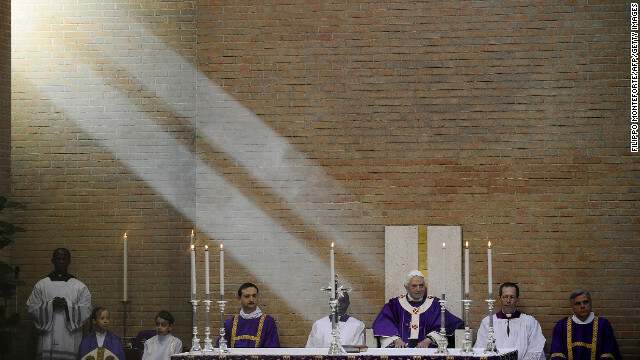 Benedict celebrates Mass during a visit to San Patrizio al Colle Prenestino parish on the outskirts of Rome in December 2012. 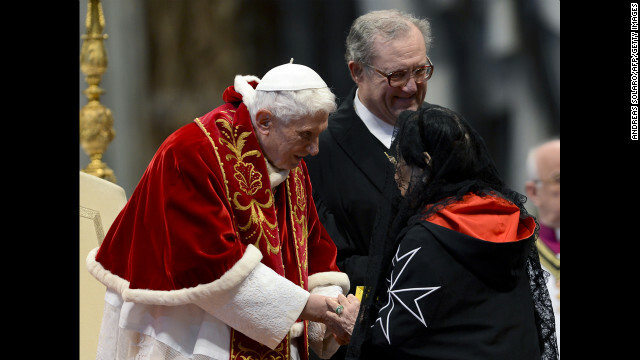 Benedict, accompanied by Grand Master Matthew Festing of the Sovereign Military Order of Malta, right, shakes hands with a woman after the Mass in St. Peter’s Basilica to mark the 900th anniversary of the Order of the Knights of Malta on February 9, 2013, at the Vatican. Benedict blesses members of the ecumenical Christian community of Taize, a group based in Taize, France, in St. Peter’s Square in December 2012. 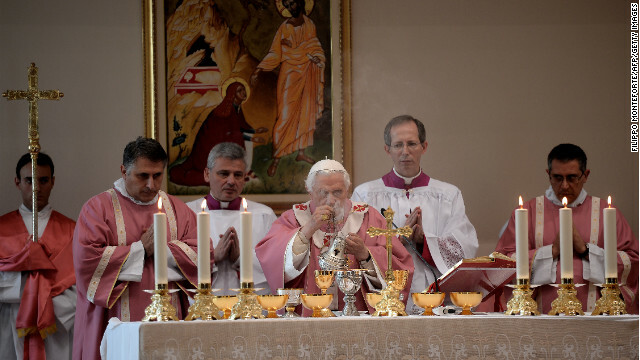 Benedict prepares to celebrate Mass at San Giovanni della Croce parish in Rome in March 2010. 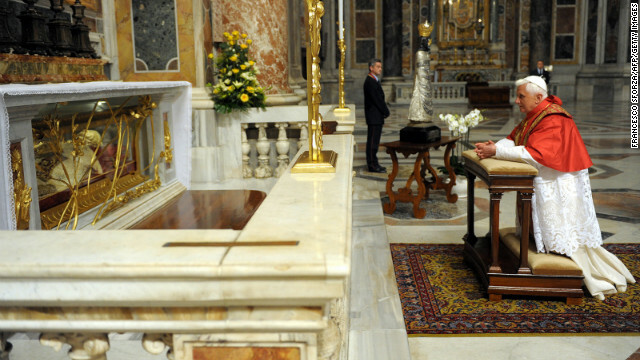 Benedict kneels as he prays in front of Pope John XXIII’s tomb in St. Peter’s Basilica at the Vatican on October 28, 2008, to commemorate the 50th anniversary of John’s election to the papacy. 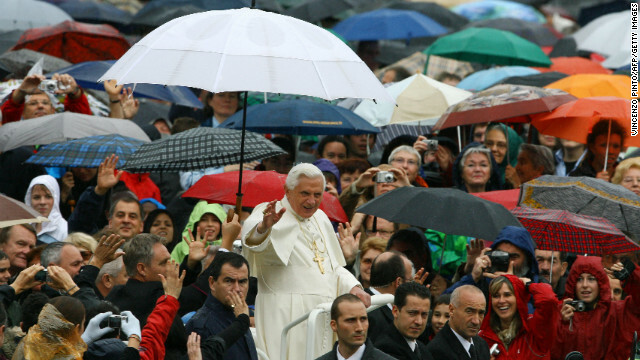 Benedict waves from under an umbrella as he arrives to lead his weekly general audience in Saint Peter’s Square at the Vatican in October 2007. 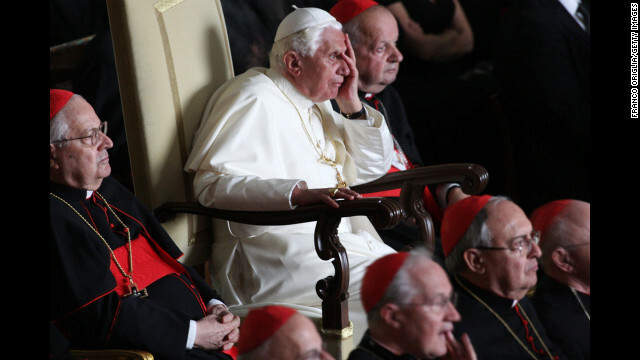 Benedict attends a screening of a movie about his predecessor, Pope John Paul II, on October 16, 2008, in Vatican City during celebrations of the 30th anniversary of John Paul’s election as pontiff. 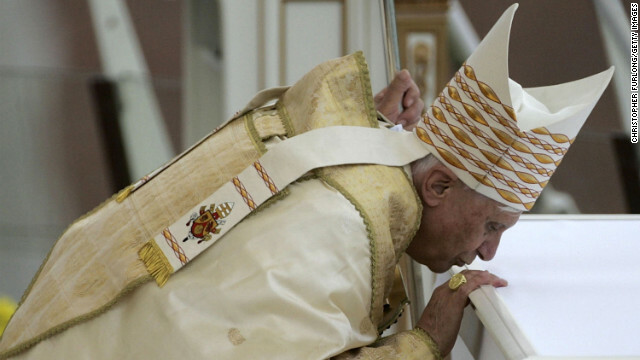 Benedict kisses the altar before addressing the crowds at Jasna Gora Monastery in Czestochowa, Poland, in May 2006. Benedict meets Prince Albert II of Monaco at the pope’s private library in Vatican City in December 2005. 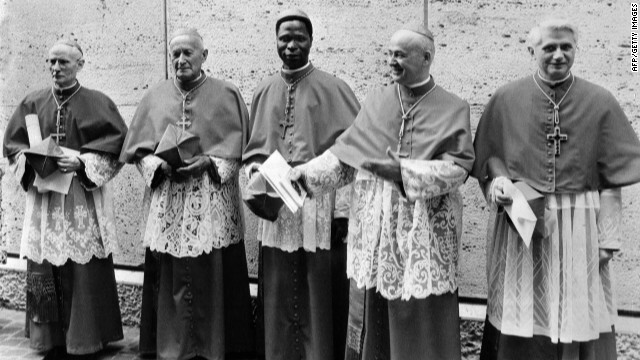 Cardinal Joseph Ratzinger, right, poses for a picture in Vatican City in June 1977 with fellow cardinals, from left, Cardinal Gappi, Cardinal Tomazek, Cardinal Gantin and Cardinal Benelli. 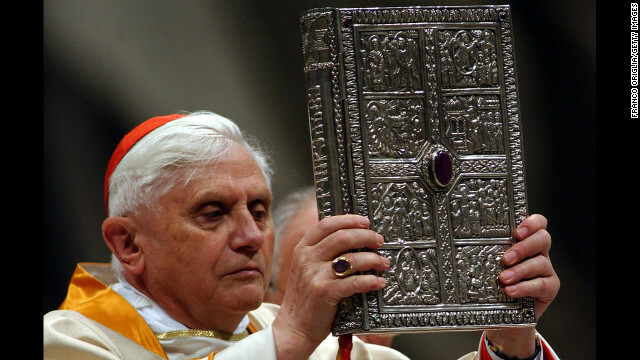 Ratzinger was named cardinal-priest of Santa Maria Consolatrice al Tiburtino by Pope Paul VI in June 1977. 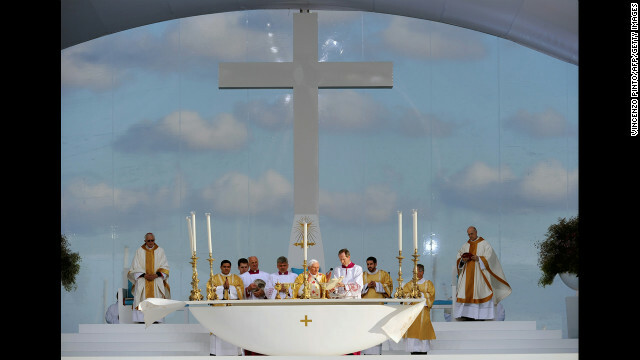 Benedict celebrates an open-air Mass in the Terreiro do Paco in Lisbon, Portugal, in May 2010. 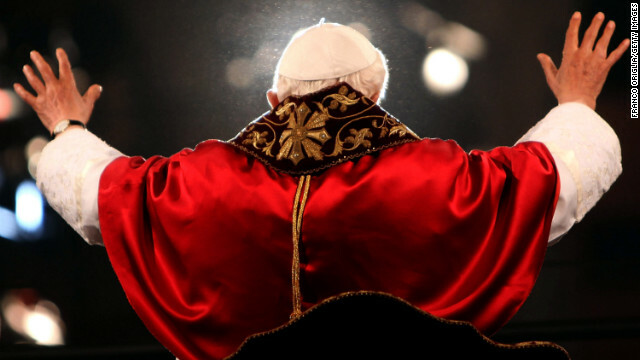 Benedict waves to the crowd gathered at the Colosseum in Rome during the Way of the Cross procession on Good Friday in April 2012. 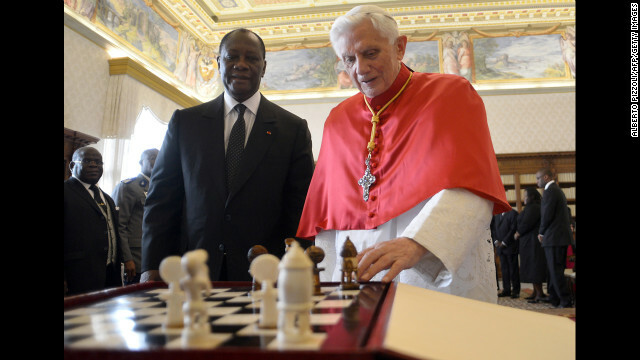 Benedict looks at a chess game with Ivory Coast President Alassane Ouattara during a private audience in November 2012 at the Vatican. 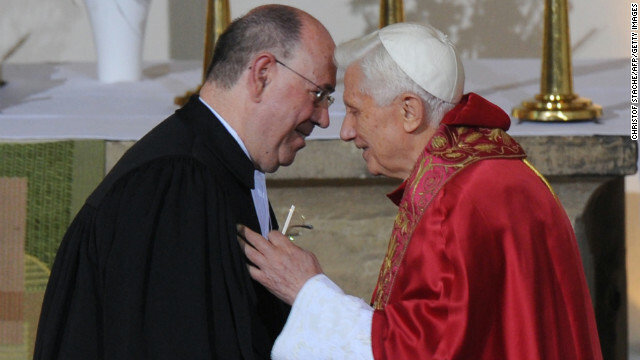 Benedict speaks with Nikolaus Schneider, praeses of the Evangelical Church in the Rhineland, before a Mass at the Augustinian monastery in Erfurt, Germany, in September 2011. 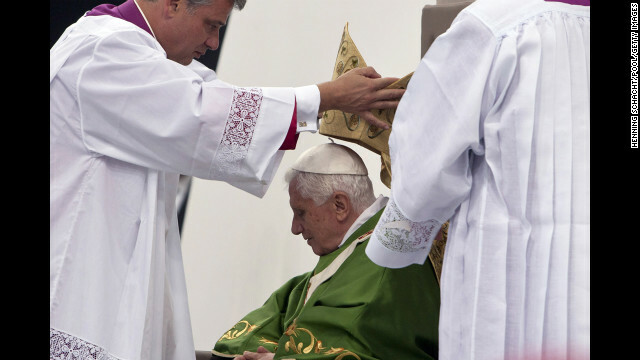 Benedict prepares to celebrate a Mass for 70,000 people in September 2011 in Berlin. 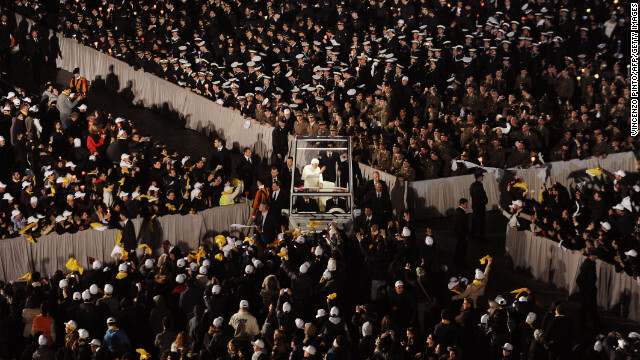 The pope salutes from his popemobile in St. Peter’s Square in March 2010. 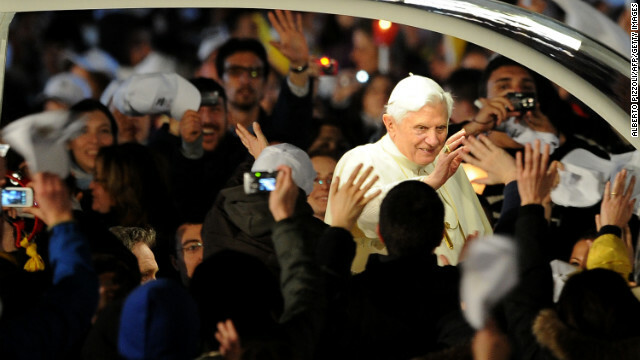 Benedict blesses pilgrims as he arrives in St. Peter’s Square in his popemobile in March 2010 to meet with young people from Rome and the Lazio region in preparation for World Youth Day. 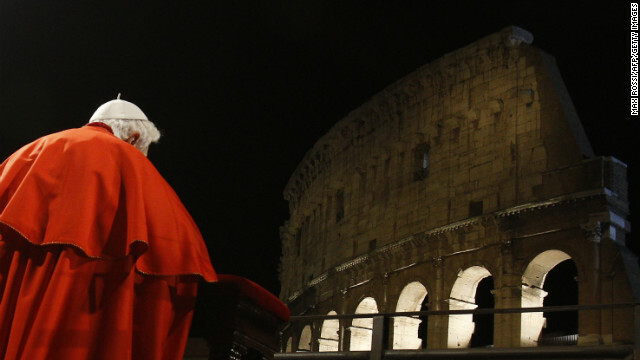 Benedict prays on Good Friday in April 2010 at the Roman Colosseum. 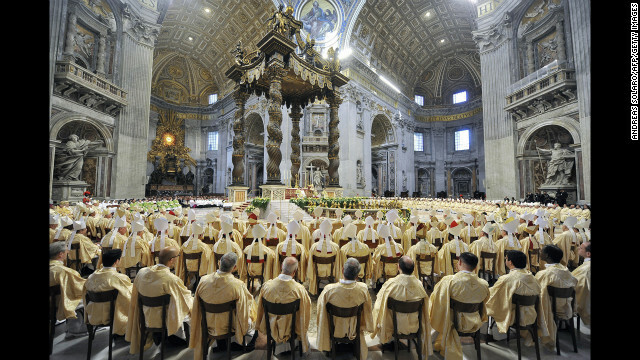 Benedict celebrates a Mass at the end of a synod of Catholic bishops in October 2008 at St. Peter’s Basilica at the Vatican.